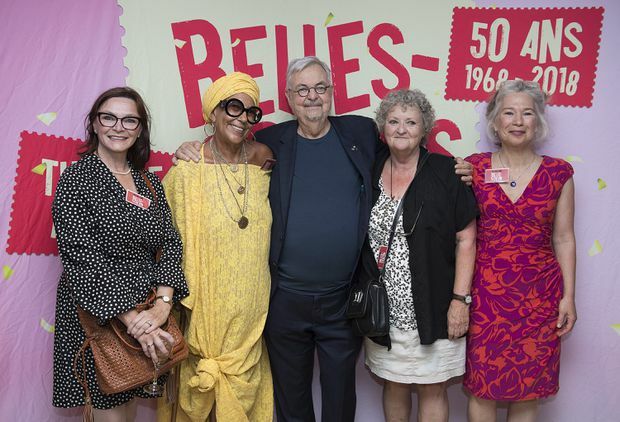 “There’s nothing left!” That line from the final scene of Michel Tremblay’s Les Belles-soeurs certainly does not describe the impact of the two-act play, premiered in Montreal 50 years ago this week. The piece abruptly reset theatre and socially-conscious art in Quebec. On the surface, it could pass for a small domestic drama, in which a working-class woman wins a million trading stamps, and invites her neighbours to her kitchen to help glue them into redemption books. Envy and resentment seep out from behind their smiles, and they gradually filch all the stamps, while chafing at the social order that chains them to their own kitchens. The women speak frankly and sometimes coarsely about their woes, and they do so in joual, the working-class French then-regarded by better-off francophones as an embarrassing dialect. Les Belles-soeurs erased the boundary between the language of common people and that of the stage, celebrating joual as dynamic and unique to Quebec. The play has remained current, and widely produced in Canada and abroad, even though much of its detail is out of date. Women in Quebec are no longer shackled to the stove and the cradle; the province even has a famously liberal system of state-supported daycare. The Plateau-Mont-Royal, the play’s working-class setting, is now gentrified and trendy. Trading stamps no longer exist, except in altered forms as Canadian Tire money and Air Miles points. Dated as it is in details, Les Belles-soeurs is a foundational document of modern Quebec. So is Refus global, a collection of essays published in 1948, which is best remembered for its opening manifesto by the painter Paul-Émile Borduas, against the stagnation of Quebec under church and state. This ecstatic document is now a hallowed text in the history of the Quiet Revolution, and enshrined as such at the Maison de la littérature in Quebec City. Quebec has a more jaundiced experience with foundational political documents, above all with the Constitution of Canada as passed by Parliament in 1982. Nobody found it liberating to be told that Quebec’s consent was not required for a law that would affect every aspect of life in the province. Bill 101, the Charter of the French Language, was also an act of government (under Mr. Lévesque as premier), but its whole purpose was cultural. It guaranteed the centrality of French in Quebec, and permanently changed the cultural landscape. No Quebec premier would dream of repealing it. Les Belles-soeurs is a dark play. The women who gather at the start in a more or less neighbourly mood end by giving in to envy and greed. A French musical version in 2010, which added 15 songs and cut more than half of Mr. Tremblay’s text, may have tried to lighten the tone. A 2014 English musical even attempted “to put a more positive spin on the ending,” as one of its creators said. For a Quebec francophone audience, the play is a vivid dead-end from the past, out of which the Quiet Revolution opened the way to a freer future. There is a happy ending, but it comes later, and off stage. The character and experiences expressed in pithy fashion by each member of the large cast are still gripping. The Guardian’s Scottish theatre critic called Les Belles-soeurs “one of the greatest plays of the twentieth century,” during a 2012 tour of a Scots version called The Guid Sisters. The original version was first seen the same year as the publication of Mr. Lévesque’s sovereigntist essay, An Option for Quebec. An early passage in the book celebrates the French language and “the group obstinacy which has kept alive that portion of North America we call Quebec.” Mr. Lévesque also writes of “our own special wavelength on which, despite all interference, we can tune each other in loud and clear.” Les Belles-soeurs is still helping to define that wavelength, 50 years after its premiere.